I created the first D.Bug while taking a Power Electronics lab class (6.131) at MIT. After each lab we’d tear out all the components from the breadboards and throw them into an unsorted “use at your own risk” box. I felt bad seeing the old components get tossed, so like a student, I collected all the free stuff and brought it home. One night to avoid doing problem sets, I was watching some mecha anime and examining all my harvested scrap electronics. When you combine the two activities, you start to notice that ceramic capacitors look like fingers, old PS2 mouse connectors look like eyes, and electrolytic capacitors look like hair curls. I still had my Weller soldering iron out from 6.131, so I made some hands from a few capacitors and TO-220 transistors, then a face, a body from an old transformer, and after about an hour I had finished my first D.Bug! He didn’t have a name, I didn’t call them D.Bugs, it was just a cool figurine that I could put on my desk and look at instead of doing homework. Many people ask me “Does it DO anything?”, and I always answer “No”, and they look disappointed. I am not an artist. I am an engineer. I spend 10 hours of my day making things that do things. Sometimes you just want to look at something without interacting with it. 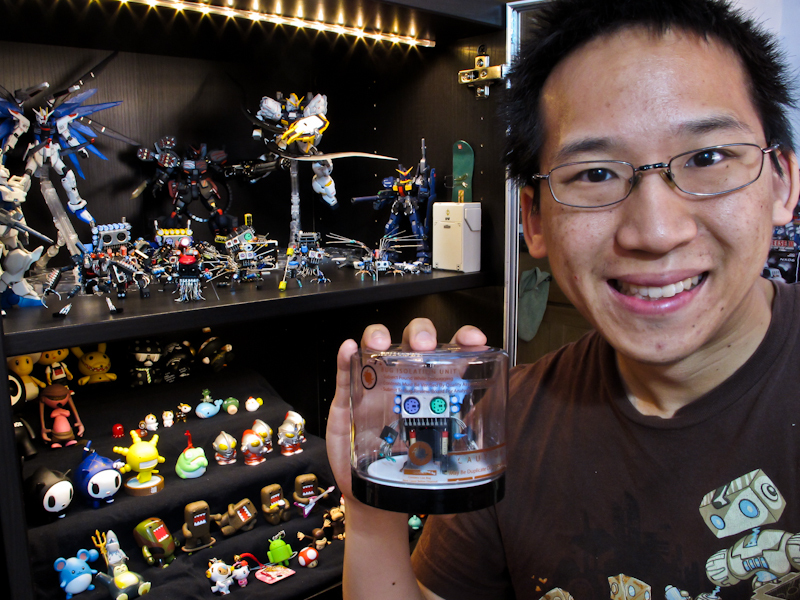 I collect vinyl toys, build Gundam models, and buy anything that has a face on it. None of these things do anything, they are just fun to look at and put into a display case. The best analogy for D.Bug models is origami. The most common applications of paper and electronics are completely flat. You write on paper just like you solder components onto a circuit board. You can create a lot of great work on paper and create some amazing circuits, but you should not be bound by convention. When you see an origami masterpiece, your first reaction is “Wow, that’s really cool!” but then you look deeper and you realize, “I can’t believe that is made out of one sheet of paper!” I want D.Bugs to have the same feel. You should first enjoy the aesthetics and then appreciate the materials that created it. D.Bugs are the next level of sculpting with common materials. A major challenge for this campaign has been breaking down the ivory tower holding up electronics as sacred and purely functional materials. I never meant to offend any of the engineers by hacking electronics into art, but the purpose of this campaign is to show that electronics don’t always have to DO something to be enjoyed. Only 11 days left on Kickstarter! This entry was posted in Projects and tagged D.Bug Model Kit on May 31, 2013 by RobotBrigade.